Late Autumn in Melbourne is a delight. A glorious smattering of oak, maple, beech, and elm trees throughout the city and surrounds. The full figure of a deciduous tree is turned as the weather cools and the days grow short. Even before Winter arrives, the ground is carpeted in brown leaves, and at the edges of the shag, some blow about in the breeze. It is at this time that the rake becomes my favourite garden tool, along with large black plastic bags. Harvest time. This was from the first week of collecting leaves. A couple of weeks after this shot, you couldn’t see the concrete under all the leaves. All this goes into making fabulous leafmold, a brown material for the compost, and as a quick and easy mulch right over the ground. Any one of these methods will help produce a quality soil alive in microorganisms. So much to collect, and all for me. The second year running at this same spot. Here’s hoping for the hat-tick. Tags: autumn, leaves, soil. Bookmark the permalink. It sure is Brook. 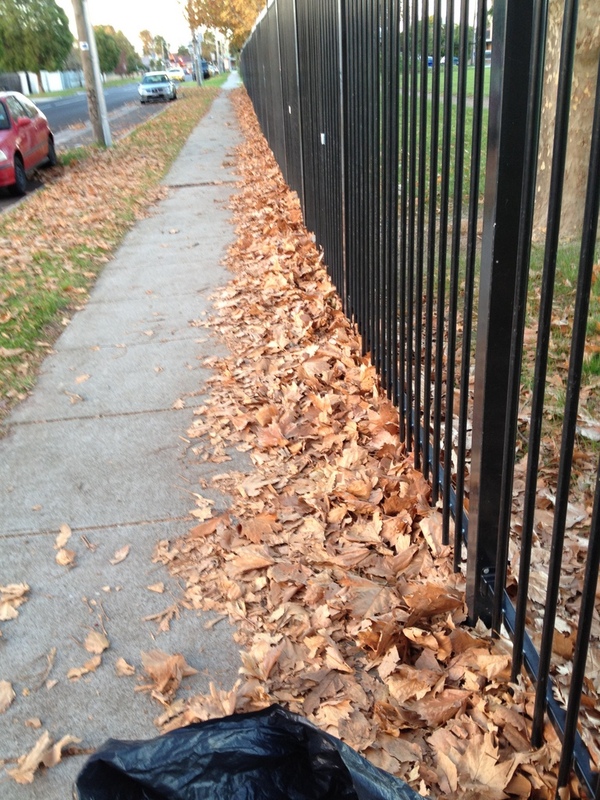 Are you also collecting leaves this Autumn? No…the leaves haven’t turned Autumn-ly yet…but I’m hoping! There are three residences in town that let me collect. I provide bags and they fill them. Sometimes I’ll pick them up (one at a time) on my bicycle trailer. Then I trench dig them directly into the soil along with coffee grounds, crab shells, corn husks, comfrey leaves, and whatever else is available. It’s free and the people like giving them to me rather than taking them to the dump or (horrors!) burning them. Do you dig them into a new place each year or do you have a dedicated composting area? I’m curious to learn more, because this year I just left them in black plastic bags over Winter, then plan to add them my various compost bins. When we harvest the raised beds at the end of summer (those that aren’t growing lettuce or kale), we trench in coffee grounds, crab shell, corn husks, kitchen garbage (no meat), and leaves when they are available in October through December. Sometimes we’ll run over them (the leaves) with a mower to grind them up a bit. Then we cover the beds with cardboard and throw old tires on the whole thing to hold everything down in the strong winds. When we uncover in the spring, the worms have multiplied, everything has decomposed, and all that’s left of the cardboard is the strapping tape. We have a separate compost bin which also takes garden waste, coffee grounds, leaves, mown grass, and animal wastes. it’s a “no-turn” affair that heats up the first year, the worms work it the second year, then we use it in the garden. I’m not sure if this got properly posted…maybe it’s not showing because it needs to be approved. I’m just repeating it in case I didn’t do it right the first time. How about I join you next time and we collect as a team? With the two of us it might actually look legitimate!